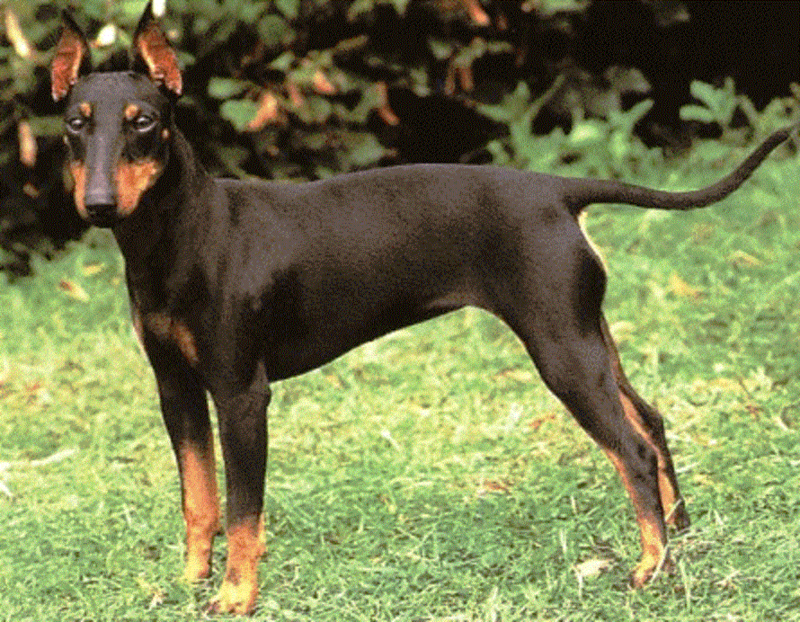 Many people think that Manchester Terriers are small versions of Dobermans. Louis Doberman used Manchesters to breed the larger Doberman, and Miniature Pinscher experts say their breed has no shared heritage. The Manchester District of England was the center of breeding by the mid-1800s for these little Terriers, so the Manchester name was bestowed upon them. The public wanted dogs of even smaller stature, so some breeders crossed their dogs with Chihuahuas to further reduce their size. This caused numerous problems - most notably thin coats, apple heads, and bulging eyes. The very small Manchesters, although delicate and unhealthy (and as small as two and a half pounds), were popular for many years during the Victorian era. Some owners had specially designed leather pouches made to suspend from their belts to take with them when they rode their horses, earning them the nickname "Groom's Pocket Piece". Even the smallest Manchester Terriers retained their fighting spirit, however.